I made this Skidoo cake for my youngest son who was turning 6 and for his party I asked him what kind of cake would he like me to make for him this year. He immediately said "Skidoo". 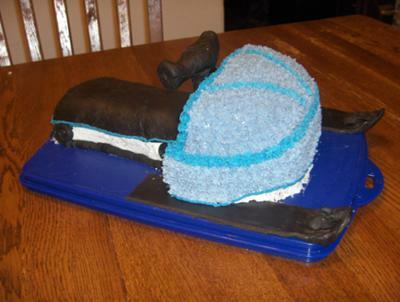 So I decided to make the cake shaped like a skidoo. I tried using one of my husbands skidoo magazines as a guide. It didn't turn out as well as I had pictured it in my mind, but all the kids were quite impressed. I used 2 boxes of Betty Crocker Chocolate Fudge cake mix, baked in 1 rectangular 13x9 cake and 1 square 8x8 cake according to the directions on the box. After the cakes cooled I shaped them with a knife and placed the square cake on top of the rectangular cake, using homemade buttercream icing to hold it in place. Next I iced the entire cake with buttercream icing. Then using tinted (with color paste) buttercream icing I made rosettes (tip #21) to fill in the color on the hood of the skidoo. Using homemade, rolled and cut marshmallow fondant (that I had made the night before) to cover the seat, shape into skis, and mold into handlebars. To tint the fondant black I used cocoa and black color paste. I used toothpicks inside the handle bars to give them stability so they would not fall over. After the fondant was in place I finished up by using buttercream icing tinted black (tip #12)for the skidoo track. That's very cool! Very creative and good job!